BROKEN ARROW (1996) is the Neil Young "with Crazy Horse" follow-up to MIRROR BALL (1995), which was recorded with Pearl Jam. "Broken Arrow" is also a John Woo film from 1996, starring John Travolta and Christian Slater. It's just an odd coincidence. 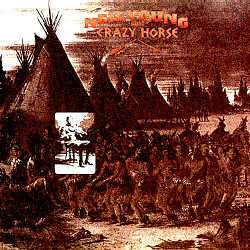 The Neil album is named after Neil's ranch. The movie says "broken arrow" refers to a lost nuclear warhead (if memory serves; after all, it's been YEARS since I've seen it). The movie also has Howie Long in it. Let's stick with Neil's album. BROKEN ARROW was also recorded shortly after the death of Neil's longtime friend and producer, David Briggs. The album opens with "Big Time", a pleasantly chunky tune, almost certainly dedicated to Briggs ("I'm still livin' the dream we had/For me it's not over"). This is the album's best song, in my humble opinion, and its meandering guitar solos leave no doubt that this is Crazy Horse Neil. As a matter of fact, the first three songs are the classic, rough-cut, loosey-goosey, long guitar workout variety of Crazy Horse. After "Big Time" (7:24), "Loose Change" clocks in at a hefty 9:10 ("Loose change in my pocket/Future in my hand/Too many distractions/For me to understand"), and "Slip Away" is another odyssey at 8:36. "Changing Highways" is a good-natured chunkster, and quick (a mere 2:20). "Scattered (Let's Think About Livin')" is even chunkier, with a nice "Ohio"-like intro. ("No more sadness/No more pain/Let's think about livin'/Let's think about life"). "This Town" is relatvely slow, but ominous, and when Neil sings "It's OK", the listener gets the feeling it might not be OK at all. "Music Arcade" is mellow and acoustic, with some oddly humorous lyrics ("I was walkin' down Main Street/Not the sidewalk but Main Street/Dodgin' traffic with flyin' feet/That's how good I felt"), and socially-conscious lyrics as well ("Have you ever been singled out/By a hungry man/You're listening to the radio/He's washin' your window/When you look in those vacant eyes/How does it harmonize/With the things that you do?"). "Baby What You Want Me to Do" is an 8-minute cover of a bluesy tune written by Jimmy Reed (in 1960, I believe) and previously covered by Elvis Presley. This version was recorded live at Old Princeton Landing, Princeton-by-the-Sea, CA. This seems like it would have been an amazing place to see Neil! I think this recording's feel of having been recorded on a micro-cassette recorder in a fan's jacket pocket is an attempt to capture the mood and setting. However, once I listened and thought, "man, that must've been cool," I started to get jealous, and now the poor quality of the recording is just kind of annoying to me. Botton line: It's a bit uneven, and certainly a departure from the cohesiveness of MIRROR BALL. Hey, the guy was essentially mourning the death of David Briggs on this album. I've seen BROKEN ARROW described as "disappointing". Personally, I like it. I really like the first 3 songs, although "Big Time" is probably the stand-out. I wouldn't call this an essential Neil album. However, I wouldn't necessarily call it "disappointing" either. Now, as for the John Woo movie of the same name...well, you get it.